Welcome to my 100th post! Can you believe that I have posted here 100 times? I really can't but then again, this year has passed by so quickly. I am not going to do anything special with this post but I do plan on celebrating my Blogiversary on January 6th! So stay tuned for awesome celebratory games and prizes! In other news, I went to the auto body shop to get the damage appraised from my accident and they were able to clean it and buff it so that I may not need to get it fixed. Still deciding of course but it's nice to have options. My paper is still sitting in draft form but I have to get a move on and finish it this week and weekend. I even took off of work on the 11th to make sure I have ample time to finish it before I submit it on 12/12. Ah the joys of Grad School. So now onto the yarny goodness. It's very pink right now. I have been busy weaving in ends on this project. I had some holiday knitting and so this one is on the back burner until that's done. I hope to get the rest of the holiday projects done this week (you know while I am procrastinating on my paper) and then get back to this. Special thanks to Samie for taking the picture! I wanted to work on something different from the garter stitches of the blanket so I pulled out my sweater. I pulled the stitches off for the arms and cast on for under the arms. I may have cast on a few to many (okay 50 but who's counting) so I am working on decreasing those to a more manageable amount. But I am so excited about this project. It's nice to be able to put it on as I go and it's no longer an orange blob on my couch for pictures. Next hat is in lighter colors! So after I made all of the Gryffindor winter knits for my boss' daugher, I felt a little bad about not making something for her son. 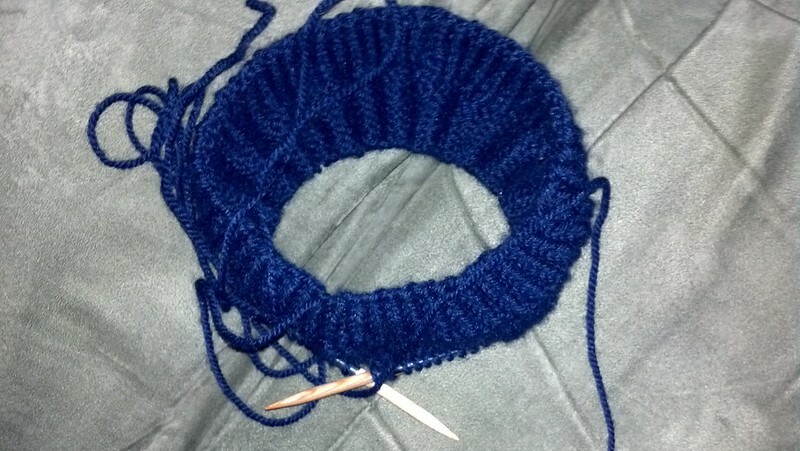 So, he decided he wanted a Ravenclaw hat and I may make a set of wristlets too if I have enough yarn. I love this pattern as it's a no brainer. Cast on, work the ribbing, work in stockinette until it's 5 inches then do decreases. Easy peasy! But navy is just as hard on the eyes at night as black so there is some challenge there. I am more of a book purist and chose the accent color to be a bronze yarn versus the grey used in the movies. Hope he like it! It's so soft and squishy! I wanted to show all of you the progress on my crochet shawl. 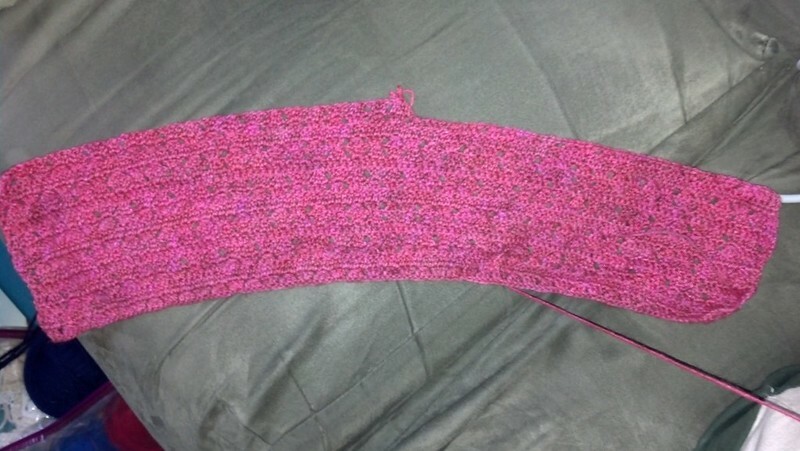 I know most of the pictures just have the swatch I did but I have been doing a row here or there when the mood strikes. Isn't the yarn just gorgeous? Well, that's about it for this week. I need to get a move on with the Owl Fingerless Mittens as the gift exchange is on Saturday! Go Go Gadget knitting needles! 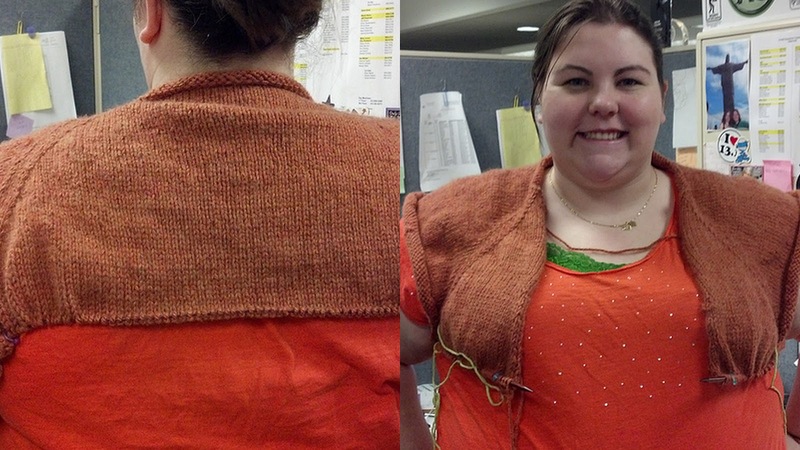 I love knitting top-down raglan sweaters, and seeing yours makes me want to cast one on. I love the color, and it looks fabulous on you. Thanks! I am really excited about it and really am anxious to work on it. 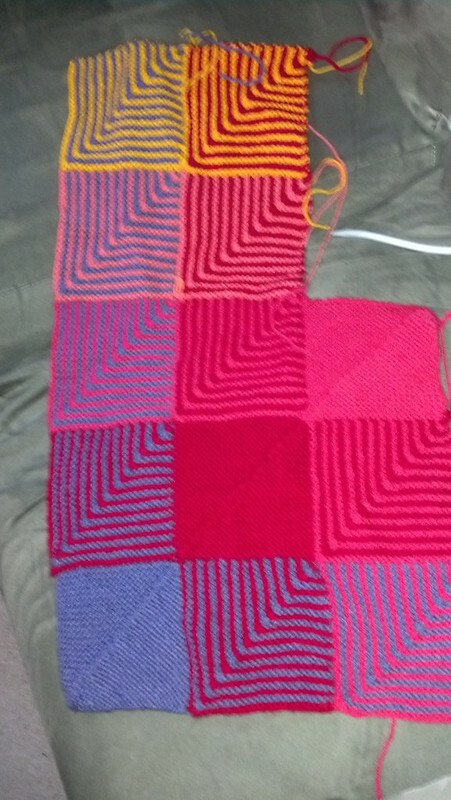 I can't decide which I like best, the shapely boyfriend, or the hue shift... all your projects are looking AWESOME! Thanks! I honestly cannot believe that it's been 100 posts but here's to 100 more. So many projects! They are gorgeous. I do generally try to roll with it but after looking at the pictures I ripped back. Generally, I debate how much it's going to bug me.